In a pinch I will use an old receipt or a scrap of ribbon for a bookmark, but I must say I enjoy finding pretty or simply interesting ones to use since reading books is one of my favorite pastimes. 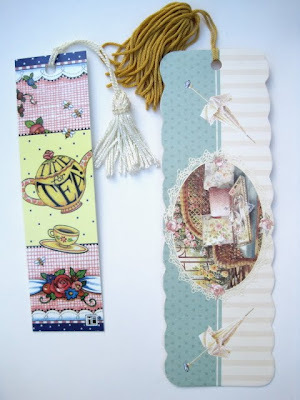 My latest tea-themed bookmark is actually a brand known as a Book Thong (no doubt the only time you will ever come across the word "thong" on this blog!). This one came from Books A Million, and although they had perhaps a dozen or more of these beaded beauties hanging there, I noticed no two of them were exactly alike. 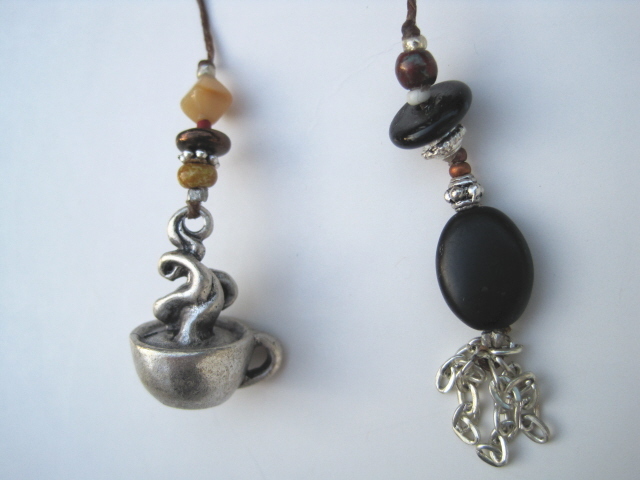 This one, of course, caught my eye because of the unusual teacup charm at one end. 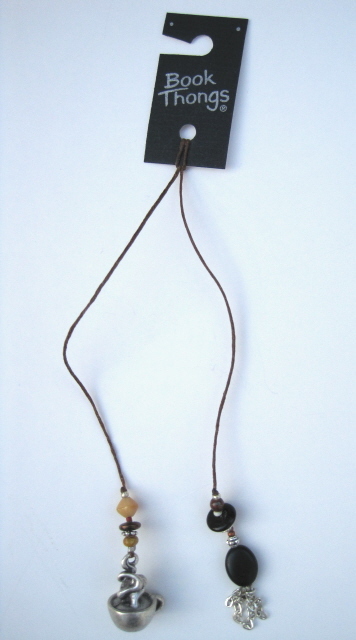 I love this, and if it ever falls apart from use one day, I will have a neat charm I can use for another project. 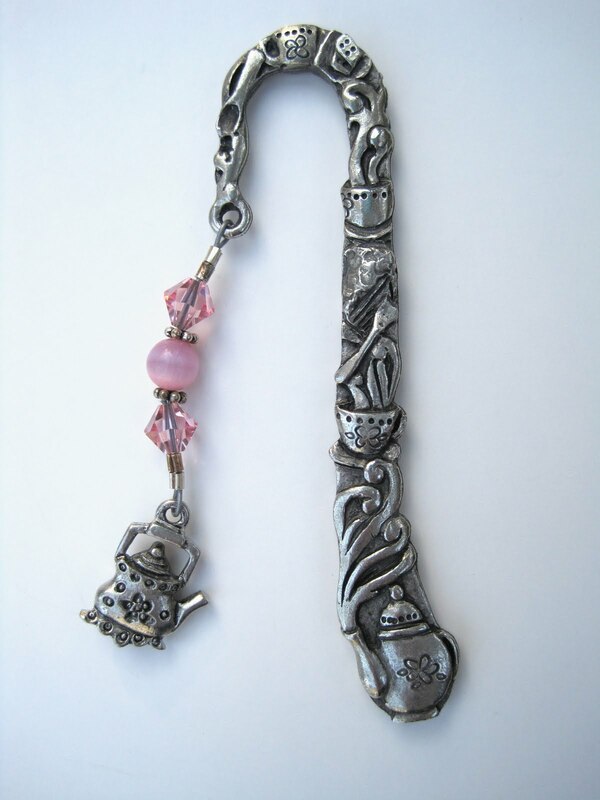 My "fanciest" tea-themed bookmark is this lovely silver and pink one I ordered from the beading daughter of a fellow tea blogger. I had seen the pretty bookmark she made for her mom and ordered one in pink for myself, and I never pick it up without admiring the lovely beads she chose for this piece. Earlier this year, I came across this bookmark for $2 in an antique mall. Do any of you remember the Past Times catalog? Oh, I used to enjoy getting that! 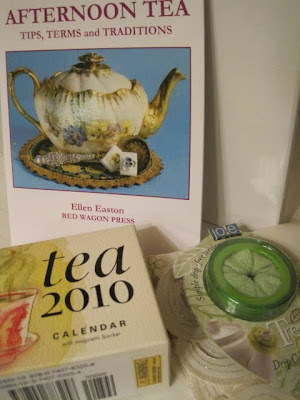 I visited the Past Times store in Bath, England once and even found a great tea book there, but I don't guess the catalog comes out in the states anymore. 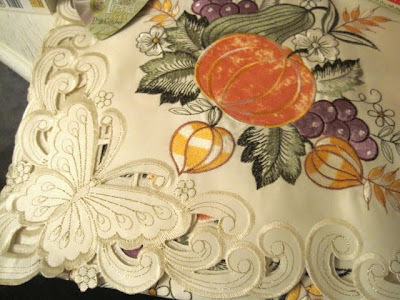 This bookmark was an eBay find, and since the ribbon is so long this will have to be used for some very tall book. 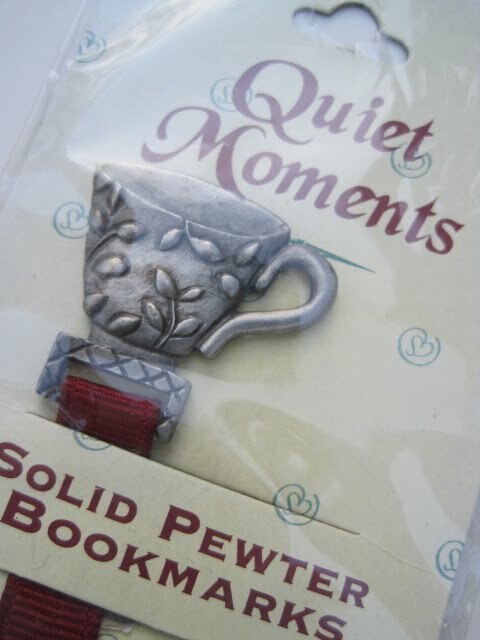 But of course the bookmarks I use most often are simple paper bookmarks, like these from Mary Engelbreit and Sandy Lynam Clough (the second one has a tea set if you look closely). Do you have any tea-themed bookmarks? Which is your favorite? 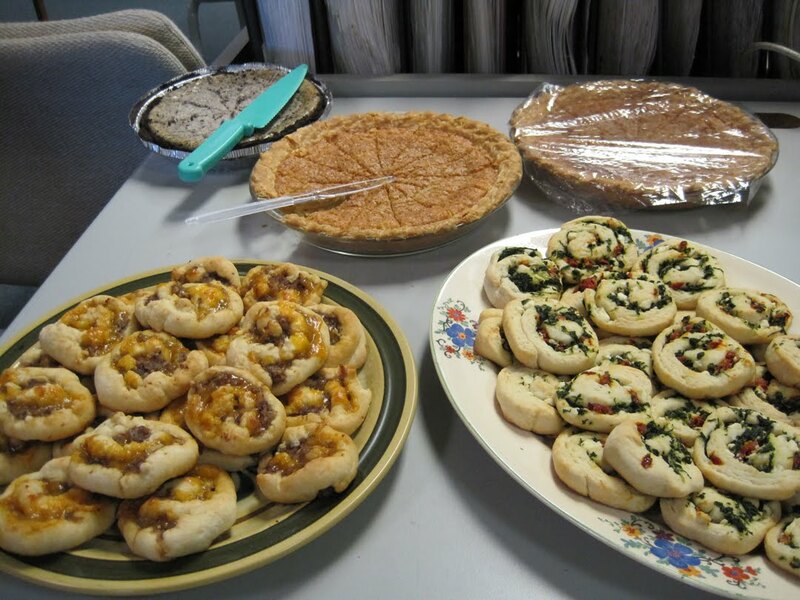 Have any leftover pie from Thanksgiving? Something super sweet and syrupy like pecan pie (or my chocolate chip pie), perhaps? 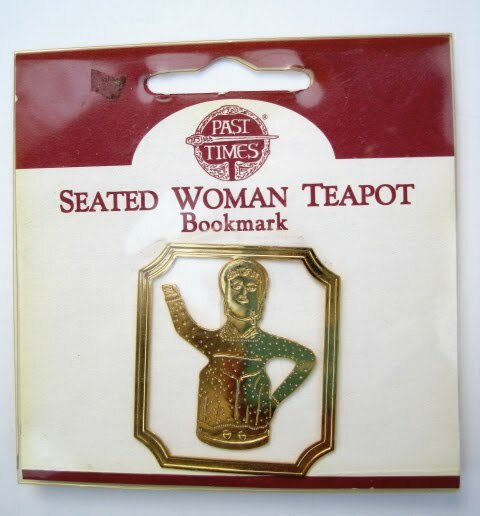 Then I have the perfect tea for you to pair with it! 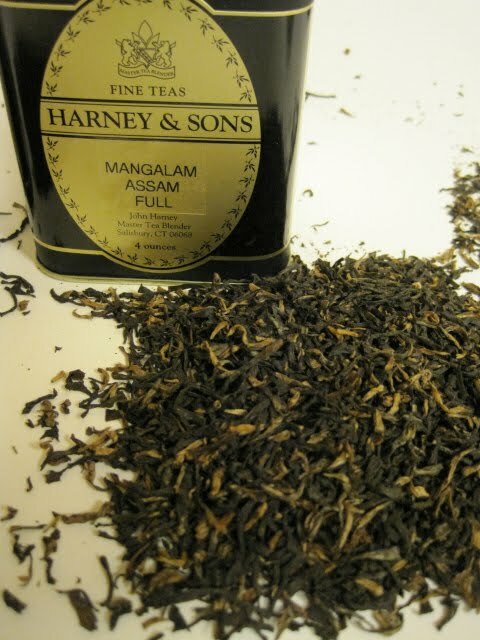 Dry leaf appearance: Choppy, tiny little bits of tea, mostly dark brown with a few lighter bits in the mix. 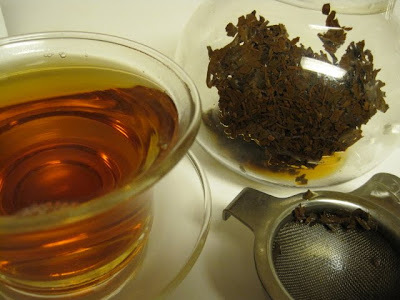 Wet leaf appearance: This is another of those teas which reminded me of wet fish food when steeped. The flat, flake-ish looking bits stuck to the side of the pot when the liquid was poured off. Steeping temperature and time: 1 teaspoon of tea, 212 degrees, 4 minutes. Scent: Dry, this tea simply smelled like any old black tea to me. 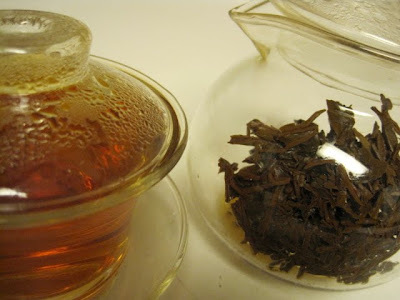 Steeped, however, the scent was much more complex. It didn't have a malty smell but more of a roasty/toasty scent, with a finish of something in the maple/honey/brown sugar family. Flavor: I was worried that even the four minutes of steeping might be too strong for my taste, but it ended up being, as Goldilocks would say, "justtttttt right." This Assam had a rich, full flavor, only the merest hint of astringency, and I enjoyed two cups of it (no milk) with an evening sliver of pie. 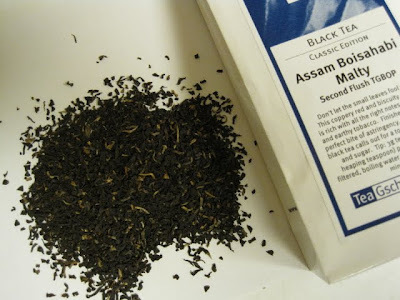 Additional notes: The Assam Boisahabi is a CTC tea, which means it is produced by the "Crush, Tear and Curl" method. Michael Harney notes that this is the only CTC tea he includes in the book. "The flavor is comfortingly stable but also somewhat predictable." Patsy Clairmont is a Christian writer and speaker whom I got to know many years ago, but I had never read her 1997 gift book "Tea with Patsy Clairmont" until I came across a copy in mint condition for $2.50 at the thrift shop What's in Store last week. I've seen Patsy live and on video and found her a hilarious and yet thoughtful speaker, but I somehow missed getting to know her as a fellow tea lover. I don't know why this connection didn't occur to me before, because one of Patsy's early books was even titled "God Uses Cracked Pots." 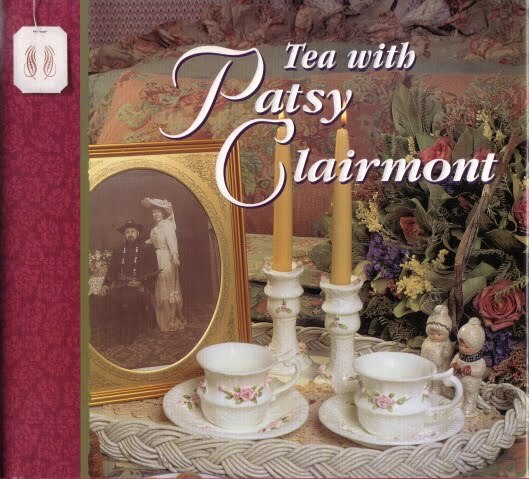 In "Tea With Patsy Clairmont," she says she has "discovered that many women relate to feeling fragile and broken. Yet we girls are finding we are strengthened when we are honest with each other and receive one another, cracks, chips and all." Amen to that! One reason I love my teawares so much is that often there's a "person" behind a piece. 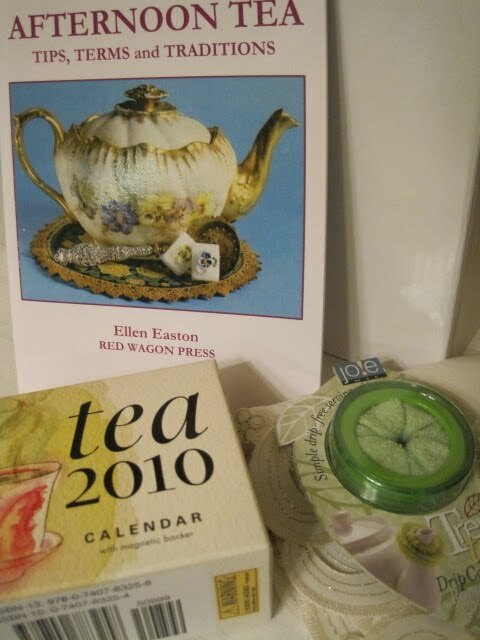 There are gifts from friends, recalling holidays and special teatimes we enjoyed together. There are also surprise treats I found while out antiquing with my mother, and even pieces I bought for myself after receiving a "shopping alert" from a friend in cyberspace! 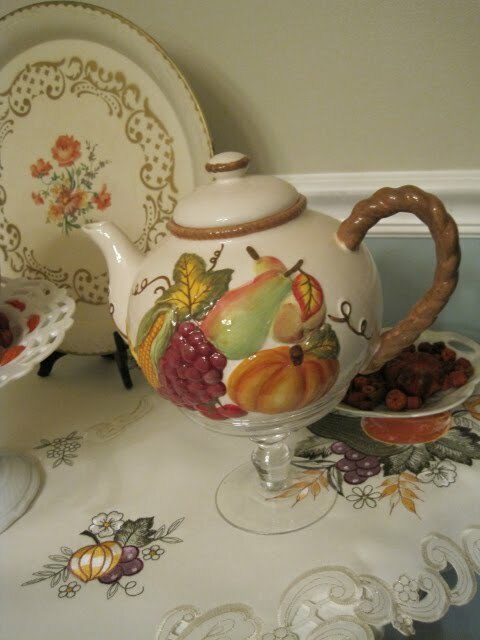 Patsy has plenty of such stories herself, and one of my favorites is about The Time-Share Teapot which she and a girlfriend share. She also opened my eyes to the importance of the spout's location on a pot. She notes that in general, "The spouts that are positioned low, close to the table, are for serving coffee. When a spout is located mid-pot, it's for tea. 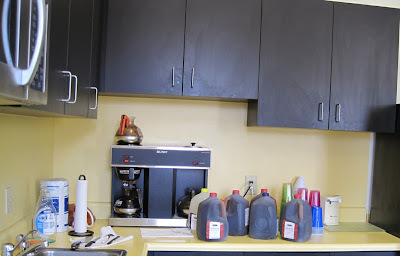 And a spout that is even with the lid is a chocolate pot." I've always distinguished pots by shape and size, mainly, but I do believe that this "spout" information lines up with what I've seen. Patsy also makes some funny spiritual applications about "spouting off," but I'm sure none of us is guilty of that! If you haven't read this delightful book, I'd definitely recommend adding it to your wish list. Cracker Barrel is a restaurant chain I like just fine, but I associate it with "dining while traveling" and often forget I have one right here in my town. I know they've long had great gift items in their gift shops, but I did not know they carry teacup ornaments until my friend Angie alerted me last week! I love the birds and the saucers' ruffled edges on these teacup ornaments, but most of all I like the sentiments! 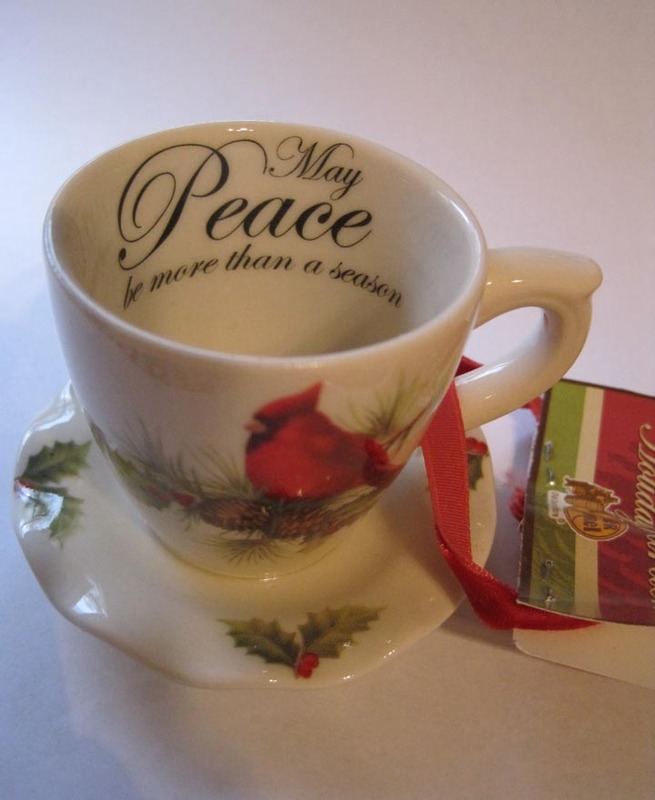 "May Peace be more than a season." Yes! 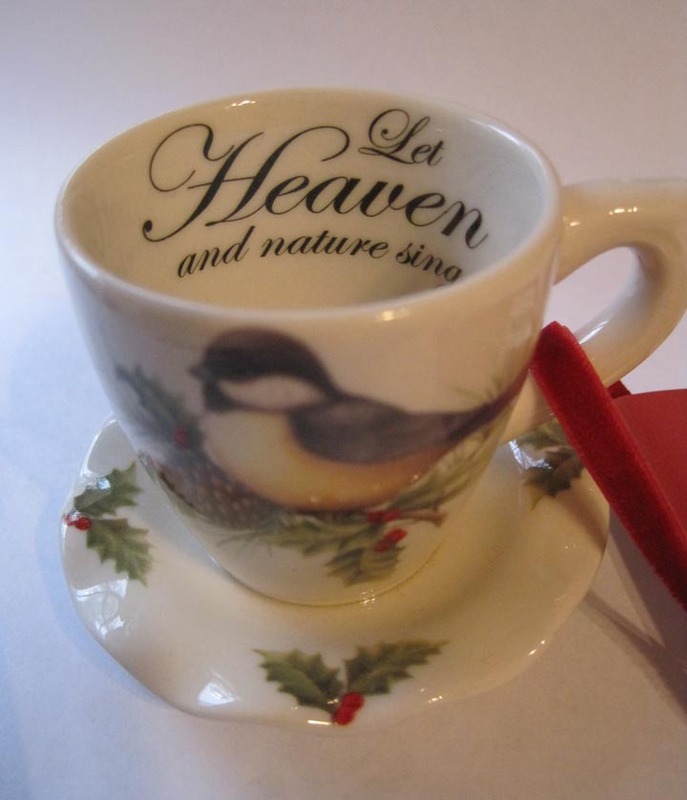 And "Let Heaven and nature sing!" So if you happen to be traveling and stop by a Cracker Barrel in the days ahead, you might want to look for these fun little ornaments. Happy trails! 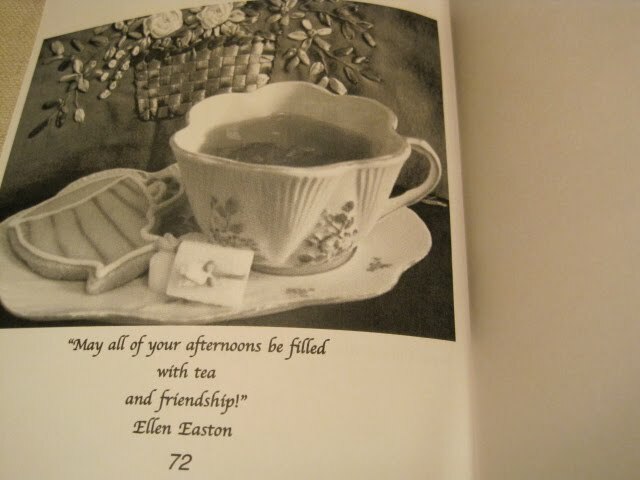 Among the tea goodies in the gift package I received from Bernideen was the book "Afternoon Tea: Tips, Terms and Traditions" by Ellen Easton. 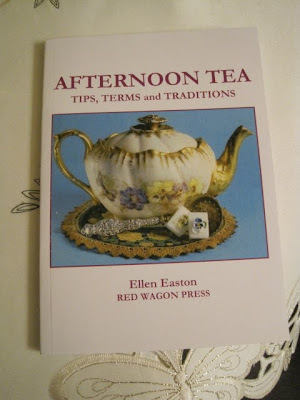 I was especially pleased to win this book, because for years I've seen the name "Ellen Easton" regarded as a top tea expert, yet I've never been able to find one of her books! There's tons of great information packed into this little book, but my favorite discovery was of a mother-daughter connection of which I'd been unaware. After years of reading tea books and magazines, I knew the name "Reva Paul" belonged to a woman who was the queen of decorative sugar cubes, some of which are pictured in the two photos above. Turns out she is Ellen Easton's mother, so clearly the apple didn't fall very far from the tree! 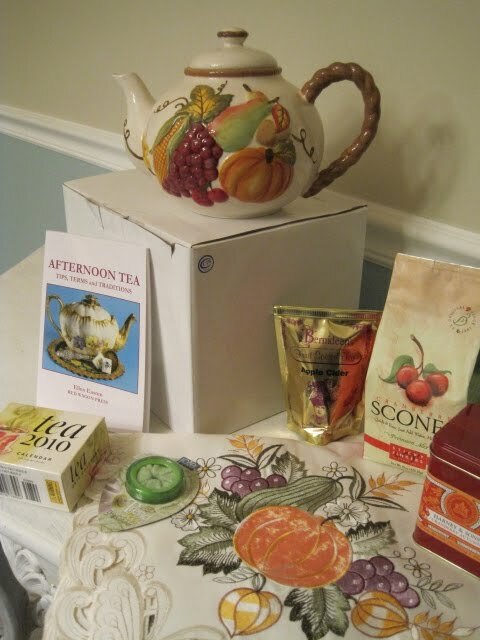 A week ago, I got the miraculous news that out of 93 entrants I had won the lavish "Abundant Blessings" giveaway from Bernideen's Tea Time Blog! 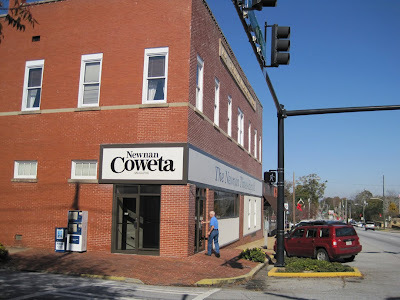 By the end of the week the wonderful package of goodies had made its way from Colorado Springs to Newnan, and I have been celebrating ever since. 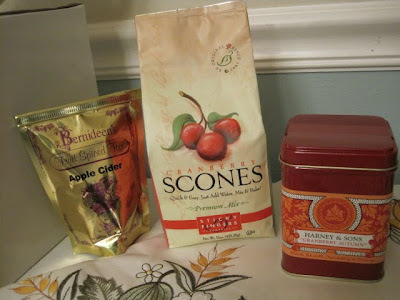 ... Bernideen's own delicious Apple Cider Tea mix (the first thing I tried), some cranberry scone mix, and something I have been craving this fall, some Harney and Sons Cranberry Autumn Tea! And last but not least, this wonderful harvest-themed teapot! 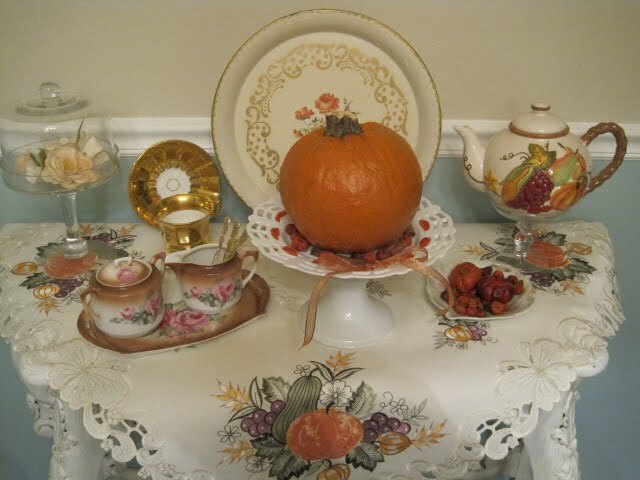 The new decor prompted me to redecorate a small table in the dining room so it will look Thanksgiving-y for family visiting this week. 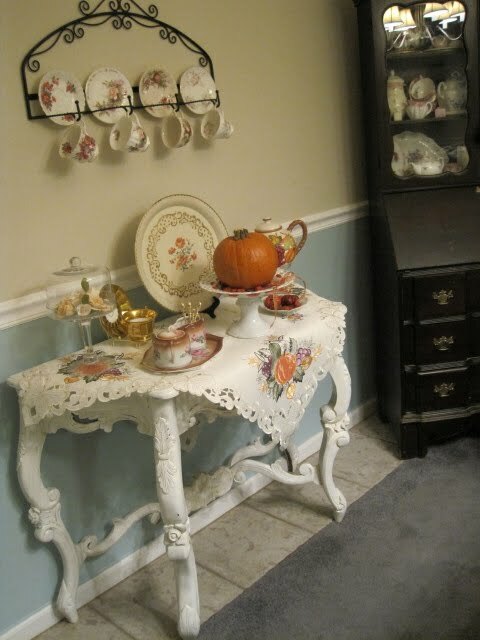 First, I elevated the teapot by placing it on one of the clear glass mini-cake stands I got a few weeks ago. 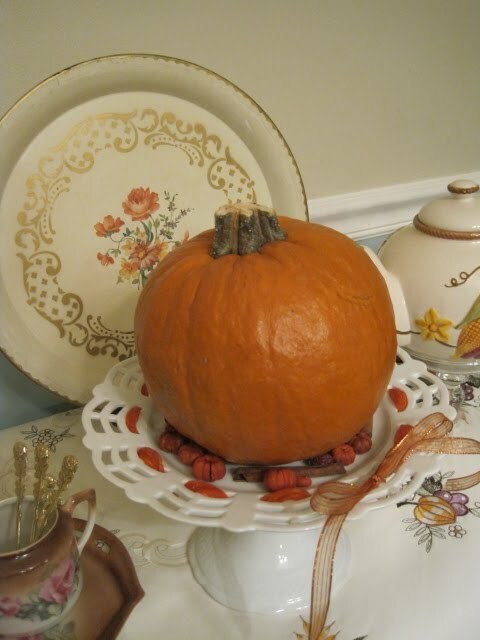 A pumpkin which wasn't carve-worthy has retained its shape, so I put it atop this old favorite cake pedestal I've had for years. I love that I can change the ribbon out to match whatever the holiday I'm decorating for. 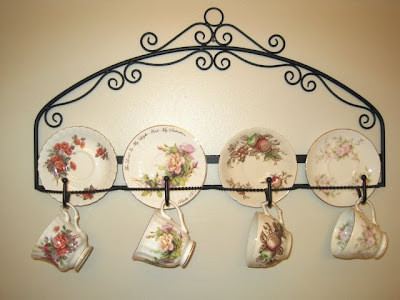 Of course one thing leads to another when you're redecorating, and I realized the pastel chintz teacups hanging overhead would have to go. I plundered through my "tea cabinet" in the kitchen and gathered cups in tones of cream, peach and brown. 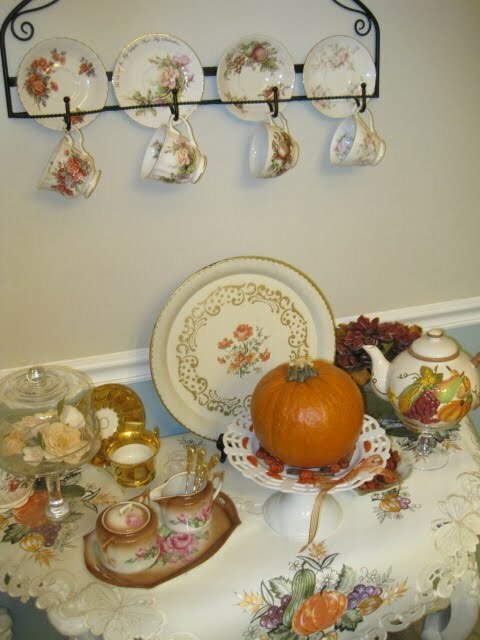 But then I realized I had placed a dish of potpourri *behind* the teapot and it really wanted to be in *front* of the teapot. There. Done. Oh, except that I think I need a little more color back there. 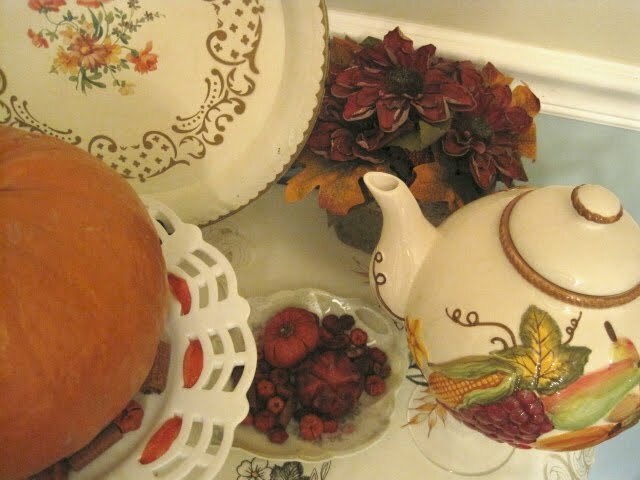 How about an old silk flower arrangement fetched from a cabinet out in the garage? Yes, that works. When you're trying to sample 58 teas in the course of 52 weeks, there comes a point when you simply have to double up, and this week seemed like a good time to compare two teas in the same family. 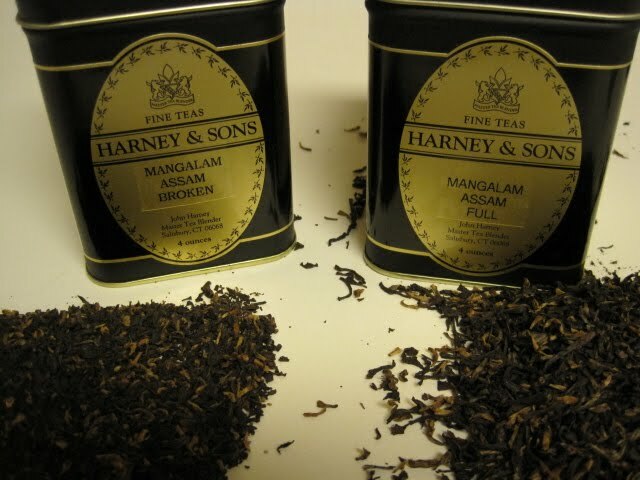 The two teas were Mangalam FTGFOP (fancy tippy golden FLOWERY orange pekoe) and Mangalam FTGBOP (fancy tippy golden BROKEN orange pekoe). 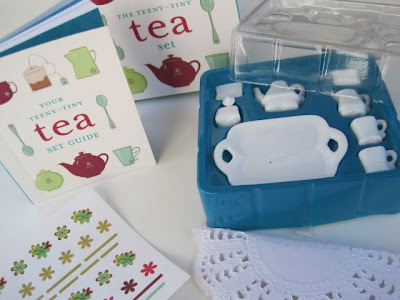 According to Michael Harney's book, "flowery" means the tea consists mostly of the largest particles of tea, while "broken" means (sensibly enough) the smaller, broken pieces of tea leaf. I ended up being quite glad I tasted them this way! 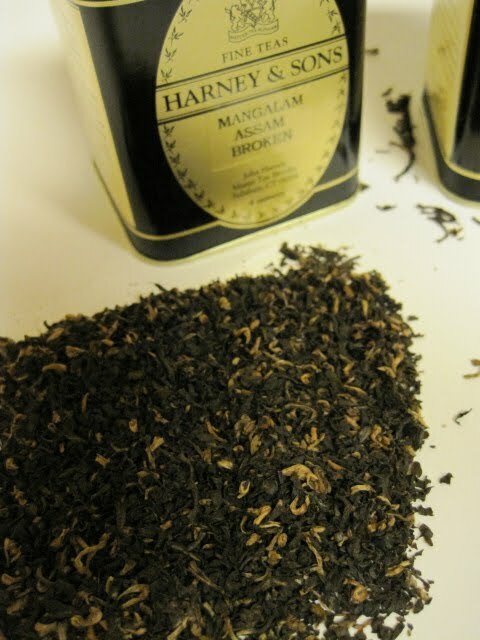 Dry leaf appearance: Dark, almost black bits of tea leaf with many lighter brown pieces scattered throughout. 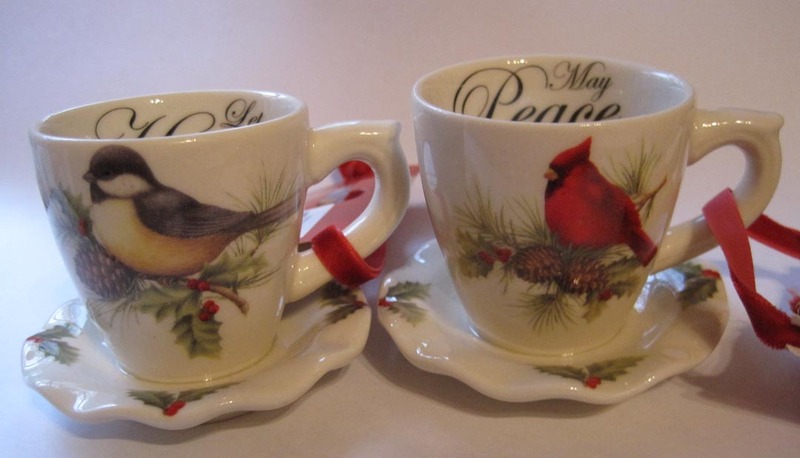 Even a non-tea drinker would be able to look at these and tell which one is broken and which one is flowery. Wet leaf appearance: The broken tea was very choppy looking; the flowery tea's leaves were noticeably larger and more uniform. The flowery tea is the one shown in the last photo above. Scent: Dry, I thought the broken tea smelled like traditional black tea while the flowery tea had more of the malty scent. Once steeped, I found the scent of the two teas indistinguishable, both smelling like a nice strong roasted tea, and I really tried to detect a difference! Color: Dark bronze for both. Flavor: Now this was interesting. The broken tea is the one I actually sampled first. It was a nice, strong tea, but about halfway through it seemed a bit *too* strong and I added milk hoping to cut the astringency I was detecting. Perfect! I loved it. 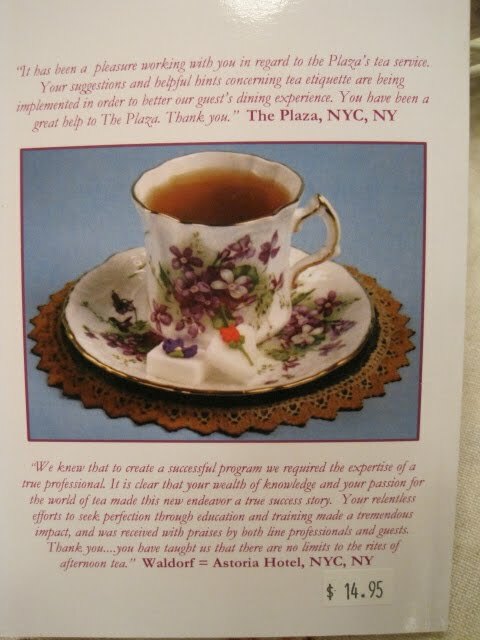 But then I tried the flowery tea. The taste was richer, fuller, almost a sweet taste, and I didn't detect any astringency and didn't need milk. So I actually enjoyed both these teas very much, but I would probably have milk with the broken tea again. Additional notes: Well what do you know, I accidentally did something right! Michael Harney says, "Tasting the two next to each other helps illustrate how much leaf size helps determine a tea's characteristics." I thoroughly agree! I also like the way he says the broken orange pekoe tea "emphasizes strength while the (flowery) shows off its sophistication." 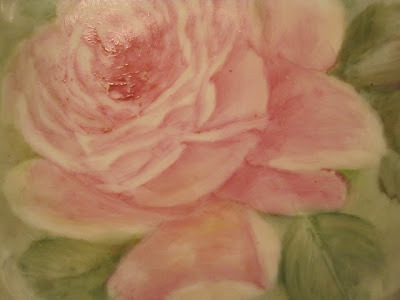 "A rose is a rose is a rose," said Gertrude Stein. Well, yes. Unless it's a handpainted rose. A great big pink one. Vintage. In perfect condition. And on a tea trivet! 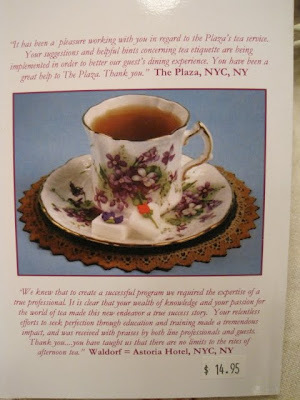 The little blue postcard announcing the estate sale on Parks Avenue arrived last week. The blue postcards normally stop coming by this time of year, and yet this is the second one I've received in as many weeks. How fun! I got to the sale a little late in the morning so my expectations of finding anything were low. 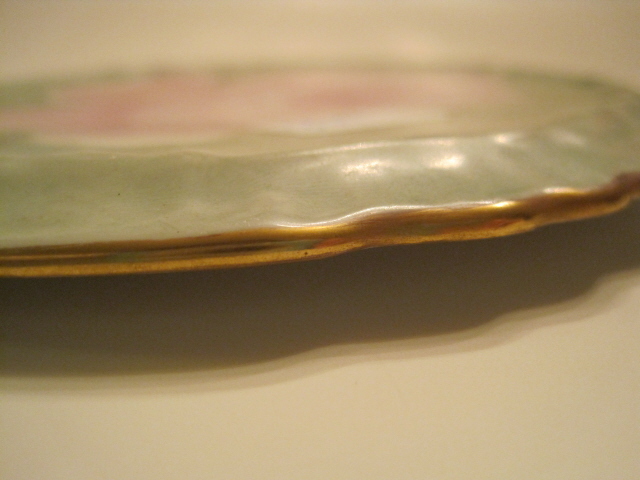 Then I glanced across a few tables and immediately spotted this gorgeous old tea trivet. The price was right, and the design was definitely calling my name. I have a feeling a number of teawares probably slipped on out before I arrived, but I think one reason I keep finding tea trivets is that they look like orphaned saucers and are so easy to pass by. 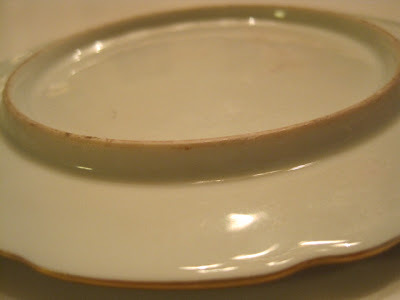 (Tea fanatics, however, know that these pieces were used to keep hot teapots from scorching the tabletop.) 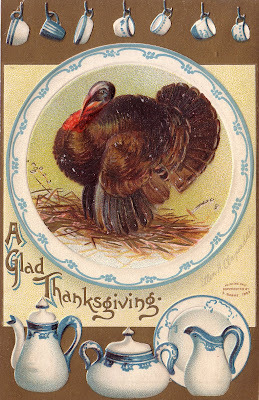 This one is 6-1/4 inches in diameter, but what usually catches my attention is that the "saucer" is standing a slight bit off the table, even casting a shadow, like here. 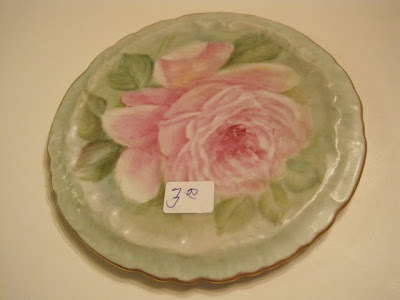 Some trivets have ball-like feet, but this one has a simple circular rim on the underside to hold it aloft. This may well be my most favorite tea trivet yet! 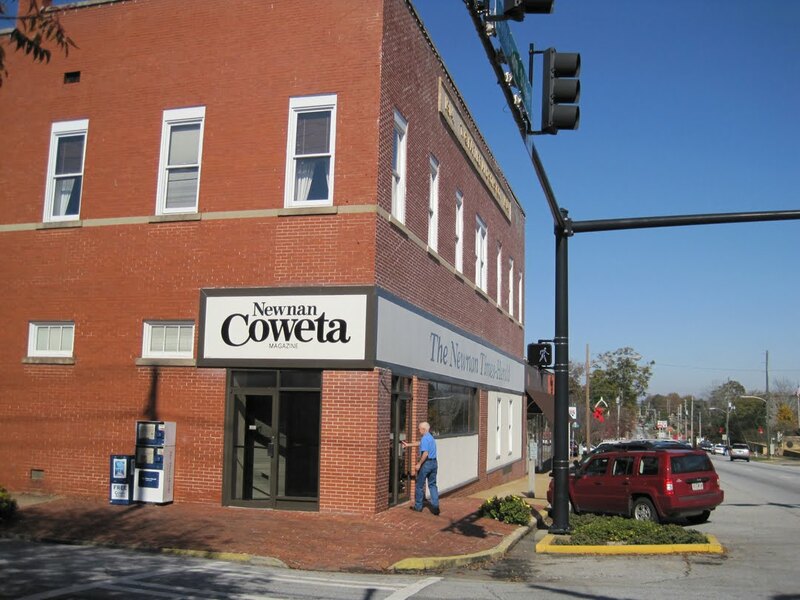 Just for fun, I thought I'd share a brief tour of what Thanksgiving looks like at the offices of The Times-Herald and Newnan-Coweta Magazine! You know a luncheon is coming when the counters in the break room begin to fill up with plastic cups and gallons of tea and lemonade from Publix. We love to eat at my workplace, and all throughout the year we have events such as a chili cook-off, soup fest, and quite a few hot dog and hamburger lunches in the summer where all we have to do is show up and eat! Thanksgiving and Christmas mean potlucks. 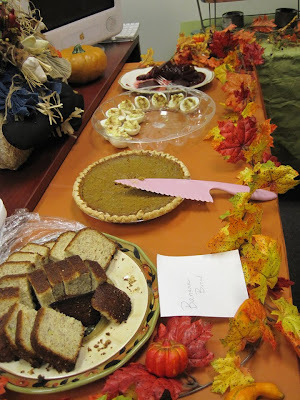 Thanksgiving is the one time of year that, instead of gathering together in one location, we set up foods by department. At the entry to the news department yesterday, the offerings included some beautiful savory pinwheels and yummy looking pies. 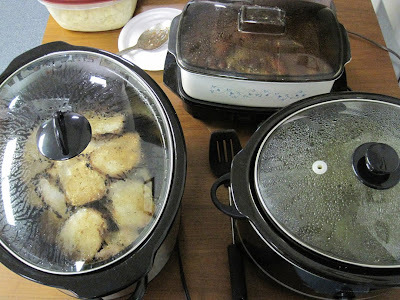 Pork loin and other crockpot meats were simmering on this table. 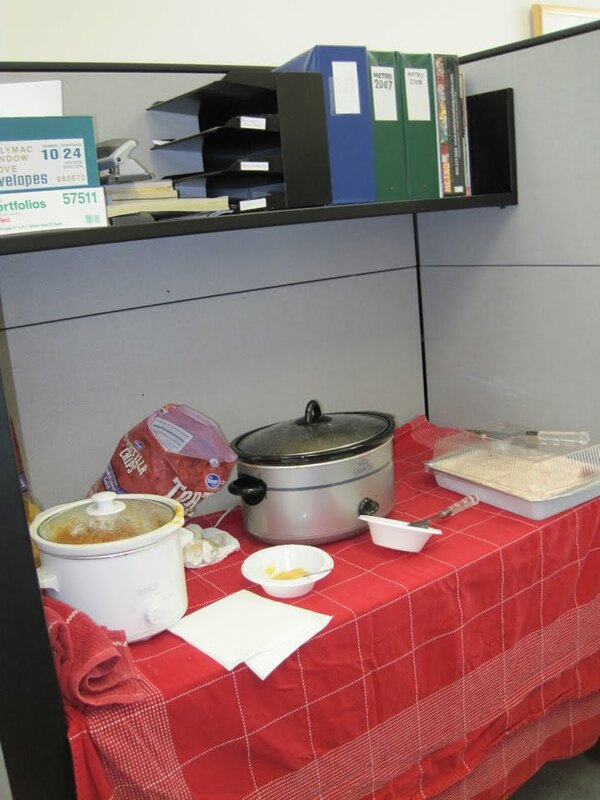 We have often said it is hard to work when you're salivating over the food fragrances wafting through the air at 10 a.m.! 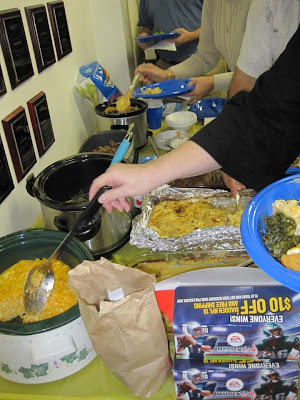 Downstairs in graphics and advertising, I was hearing lots of oohs and aahs over the turnip greens and sweet potato casserole and macaroni and cheese. One of the most festive displays was by my co-workers in graphics. Isn't this pretty? I assumed it was a group effort but soon learned my friend Debby is the owner of *all* that lovely Thanksgiving decor. 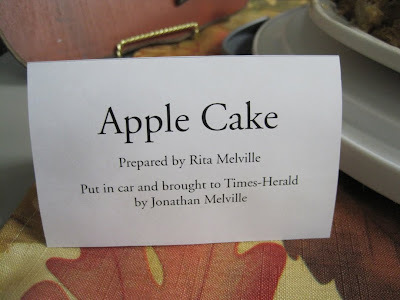 I was particularly impressed by the very honest signage our Jonathan, a young single guy, included next to the gorgeous and yummy cake made by his mom. In classifieds, I found the delicious crockpot meatballs made by my friend Rhonda! She makes hers with pineapple and they are dee-lish. 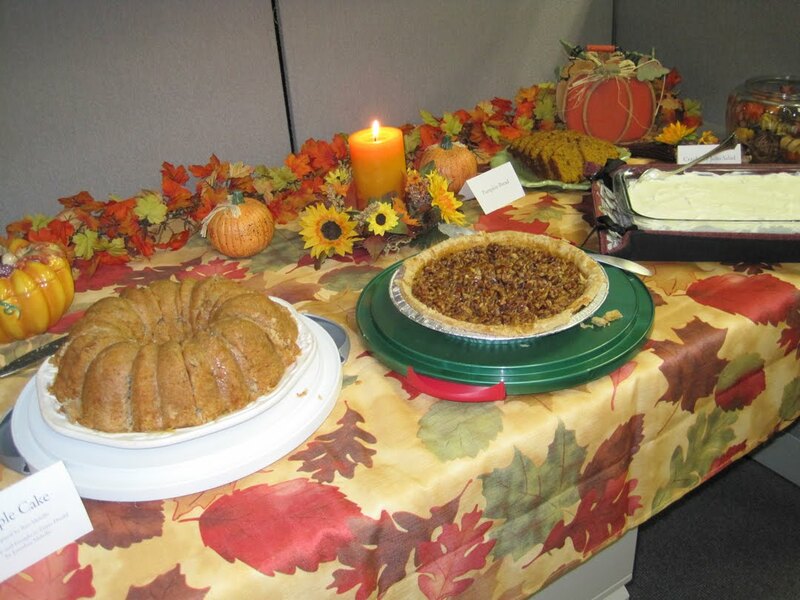 Wish I'd saved room for the cheese dip and strawberry cake, which I hear were great! I was so full from lunch I had to set aside my saucer of desserts to take home and enjoy later (here it looks like a platter but it's the angle of the photo!). 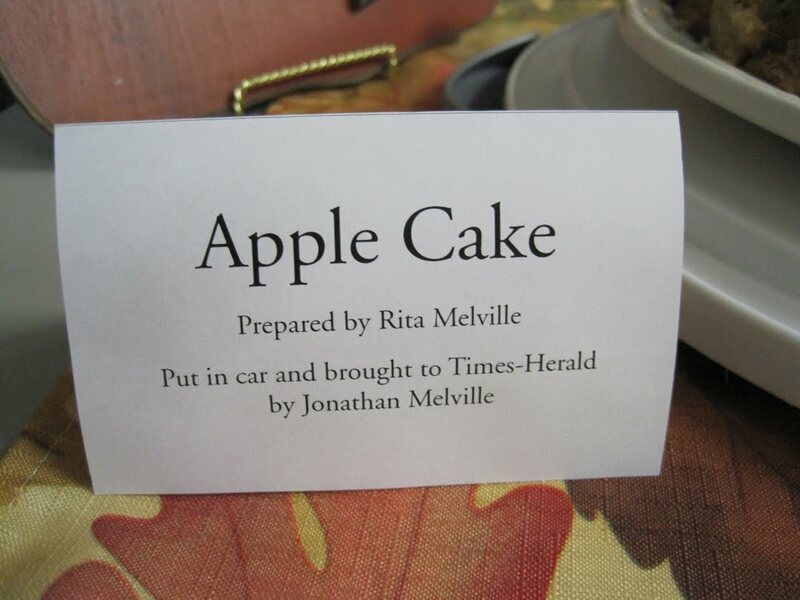 My friend Deberah's Caramel Apple Cupcakes were getting great reviews, so I stopped mid-meal to go nab one before they all got gone. (The rule around here is, if you snooze, you lose.) 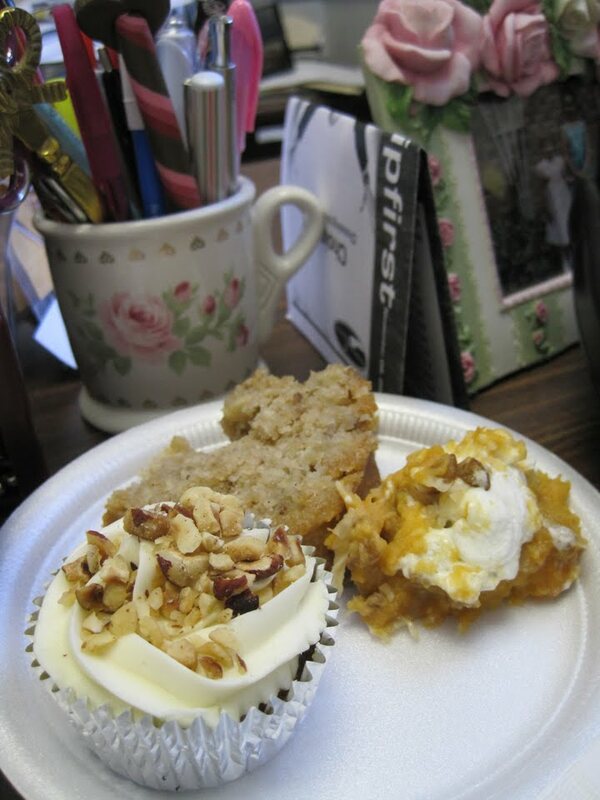 I also got a slice of Jonathon's mom's cake and the sweet potato casserole with coconut milk made by Christine. And that concludes our tour, ladies and gentlemen! 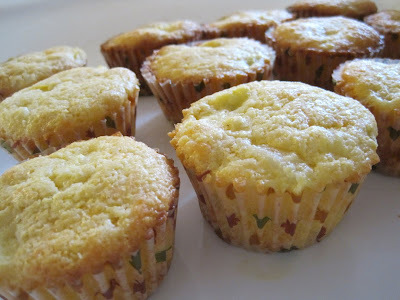 My own contribution, by the way, was a totally made-up recipe, Cheesy Squash Corn Muffins. You know those Cheese and Broccoli Muffins I wrote about recently? I was craving some the other night but had no broccoli. I wondered if squash and onions could be substituted, and I loved the results! 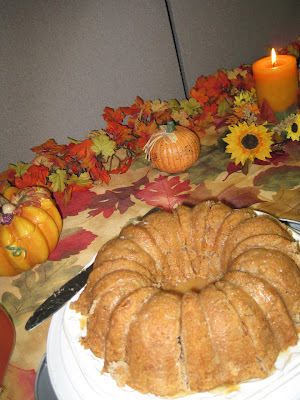 The folks who tried them yesterday were kind with their reviews (Sarah said it tasted "like a squash casserole, but in a muffin"), so here's the recipe in case you need another Thanksgiving bread/veggie for your own menu! Preheat oven to 350 degrees. Spray an iron skillet with cooking spray and add chopped squash, onion and garlic. Cook on high for about five minutes or until onions have started to become translucent. Turn off heat. Mix butter and eggs in a medium bowl, then add cheese and vegetables. Blend well. Stir in milk, add cornbread mix and stir just until combined. Use an ice cream scoop to fill paper baking cups nearly to the brim. Bake for 25-30 minutes or until tops are just starting to brown. Cool in pans. Yields 12 corn muffins. 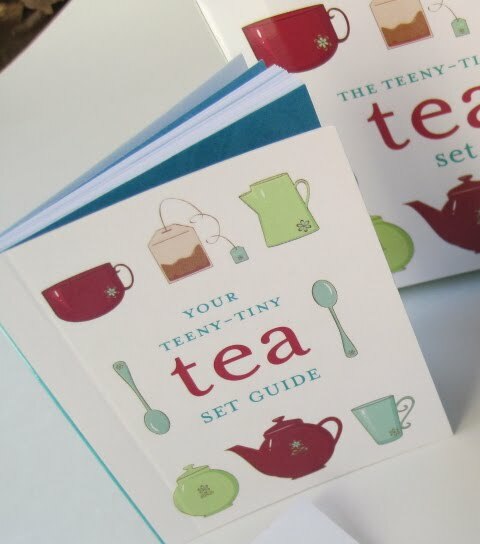 The other day I was looking for new tea books online and came across a new miniature boxed set from Running Press, The Teeny-Tiny Tea Set. These are the sorts of sets you see on racks near the cash register at bookstores like Barnes and Noble, which is where I got this one. One of the most interesting sections of the 32-page book was on tea tasting terms, words like "brassy" (according to this guide, it means bitter or sharp) and "pungent" (strong but not bitter) and "coarse" (strong but of poor quality). This set is recommended for those 12 and older. 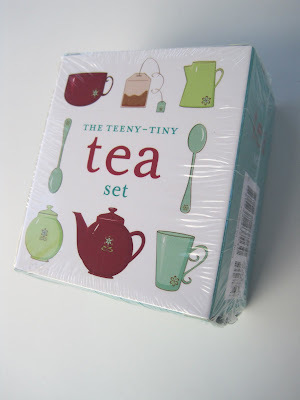 Most of us surely qualify, and I think this would be a unique stocking stuffer as well as a fun addition to a tea lover's collection. And that's all of my teeny-tiny review! A new treat for scone lovers!